The ASUS Republic of Gamers is well-known for offering one of the most comprehensive UEFI BIOS experiences and the ROG Strix Z390-I Gaming looks to follow that trend. 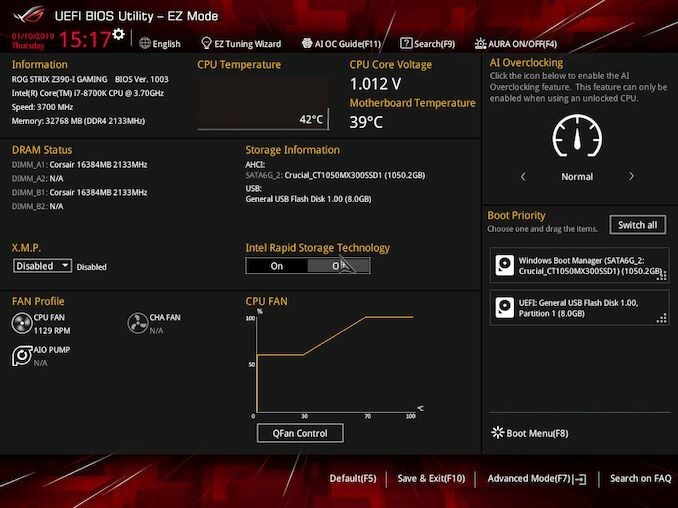 The ROG UEFI BIOS is uniform across the majority of its Strix models with a red accented background with grey central panels and white text throughout. Red and black have long been associated with the ROG brand, long before other vendors started releasing red and black themed gaming boards. Accessing the BIOS can be done by pressing the Del key during POST. Once inside, the default splash screen automatically reverts to the EZ mode; a simple and intuitive set of options intended for novice users. At the top of the screen is the date and time with a set of subheadings which can either be clicked or accessed by pressing the corresponding keys. These include the language (English), an EZ Tuning Wizard, the AI OC Guide (F11), Search (F9) and an Aura RGB on/off switch (F4). Inside of the main grey panel is a basic set of information on the boards model number, the firmware version installed and information on the installed processor. 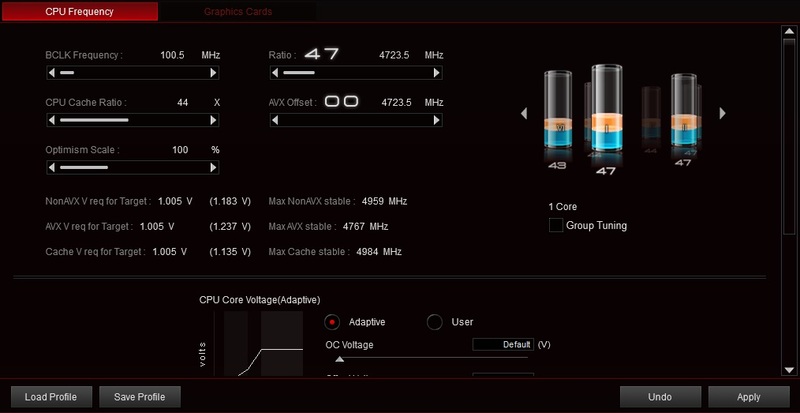 Below is a DRAM status box which shows four available channels even though it’s a two slot board; this is for the double height DDR4 32 GB modules released by G.Skill and ZADAK in partnership with ASUS which allows users to install 64 GB of DDR4 memory. Users can also enable the XMP 2.0 profile in the EZ Mode, as well as turn Intel Rapid Storage Technology on or off, set a boot priority if multiple drives or partitions are installed and select between the different AI Overclocking profiles. Also accessible is the QFan control utility for applying and customizing fan profiles. At the bottom of the screen is a Default (F5) for reverting settings back to stock, Save and Exit (F10) for applying settings and F7 which allows users to enter the advanced mode. 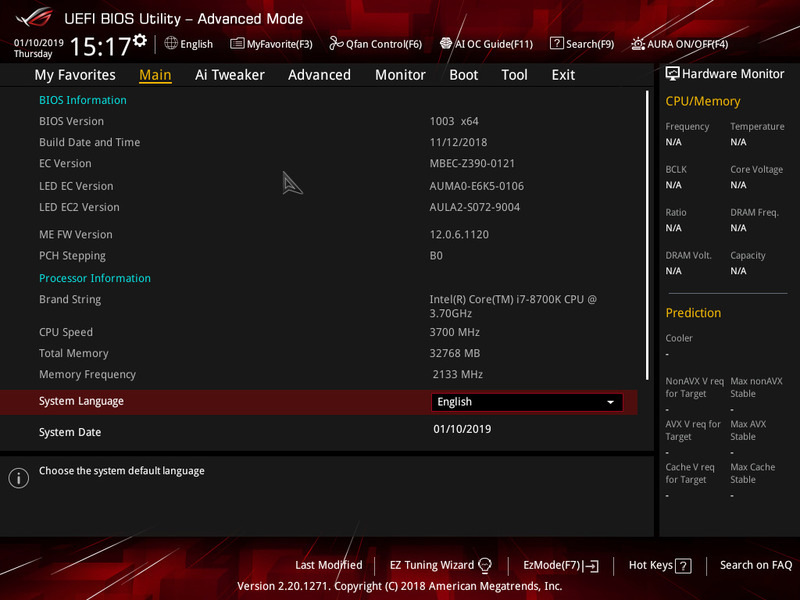 Upon entering the advanced mode brings up the main panel which lists more detailed information on the firmware, the installed processor and even the Z390 chipsets stepping number. Along the top is a set of menus which consist of My Favorites, Main, Ai Tweaker, Advanced, Monitor, Boot, Tool, and Exit. The Ai Tweaker section offers a wide variety of settings for users looking to do some overclocking. 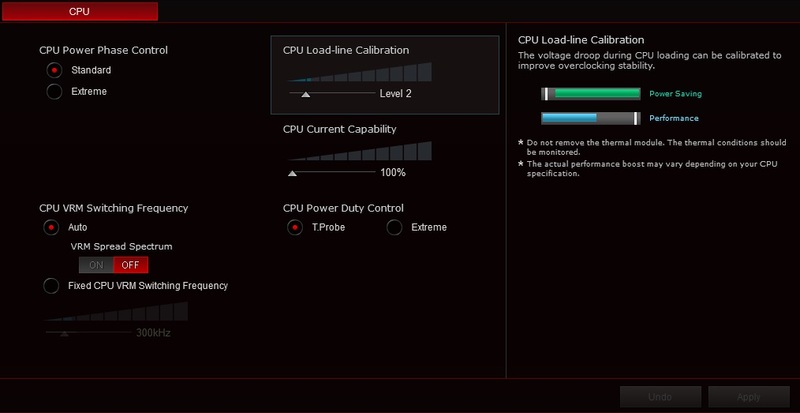 Users can select between the different Ai overclocking profiles pre-installed, or opt to customize their own. Users can also use the Ai Overclock Tuner to apply the XMP 2.0 memory profiles on compatible DDR4 kits. 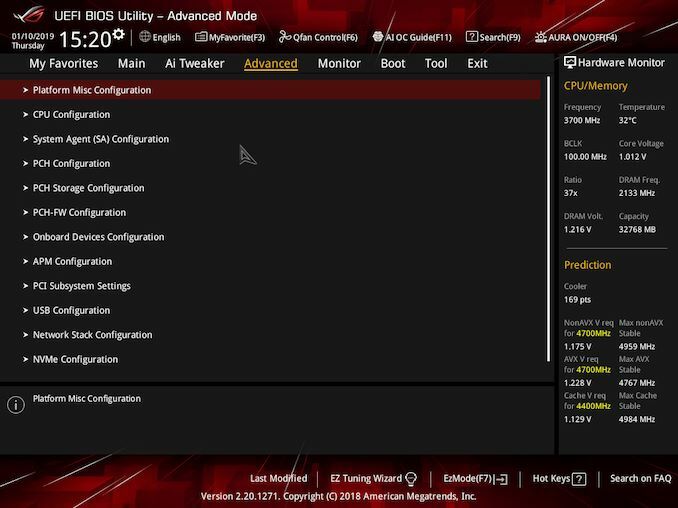 Settings like the CPU Core ratio, CPU Cache ratio, and CPU Core and Cache voltage which is linked can be altered here; all the settings to tweak memory is also found within the Ai Tweaker menu. One thing ASUS does well is providing its users with a plethora of tweakable memory settings. 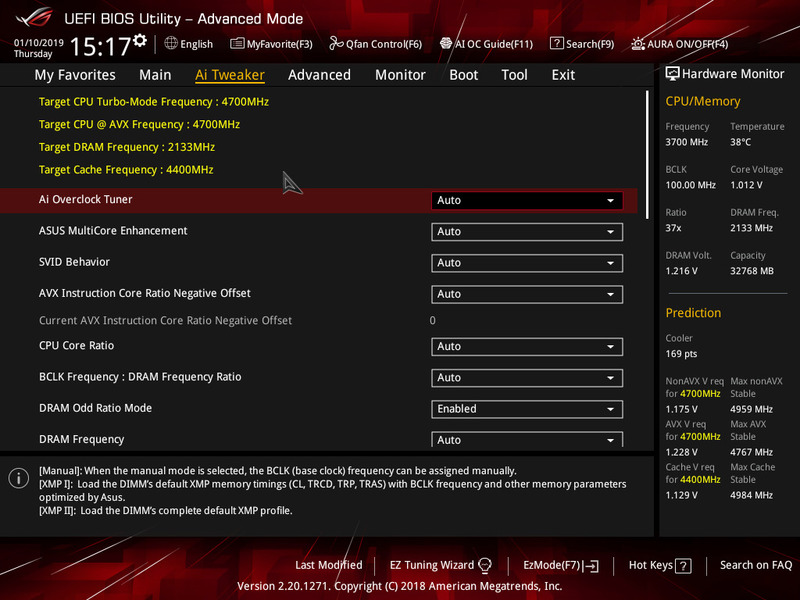 One of the reasons extreme overclockers tend to like the ASUS ROG BIOS due to the sheer amount of options available for squeezing out every last MHz of components. Primary, secondary and tertiary timings can be altered here as well as plenty of voltage options relating purely to the memory. Within the advanced section, users can change many different settings relating to the rest of the motherboards componentry including networking, audio, SATA, M.2 and USB ports. Users can change certain CPU power management settings including enabling and disabling Intel’s SpeedStep technology, Intel’s Speed Shift Technology, and enable or disable turbo mode. Users can even enable or disable the use of iGPU multi-monitor for users looking to use a discrete graphics card and use the integrated graphics for multiple monitors. 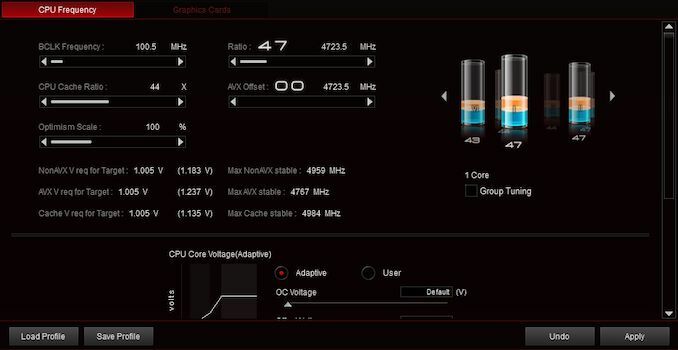 In the monitor section, users can check the temperatures from three different sensors on the board including the CPU, motherboard and the Z390 chipset. 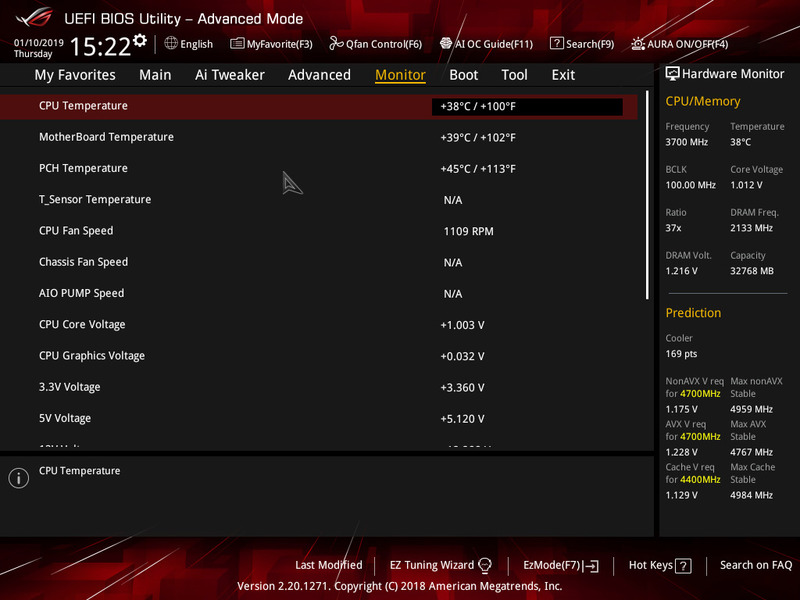 Users can also take stock of voltages on the CPU VCore, the iGPU graphics and fan speed on the three 4-pin fan headers the board includes. 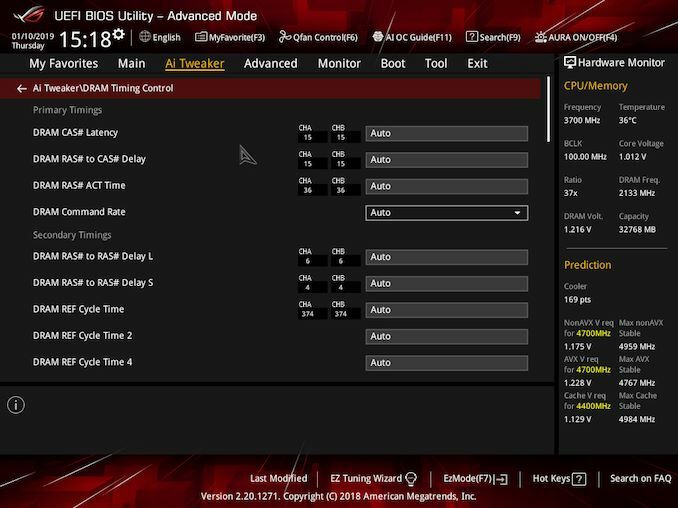 Users can also access the ASUS Qfan Tuning utility which allows users to set RPM limits on fans, select different fan profiles including standard, quiet and full speed. The AIO pump control on the dedicated pump/AIO header can also be enabled for tighter control of water flow. One of the most controversial elements during the launch of ASUS’s Z390 motherboards was the Armoury Crate application. To make installation simpler, ASUS introduced its Armoury Crate package which on first use and inside Windows, would download the full suite of ASUS drivers and software applications onto the system. 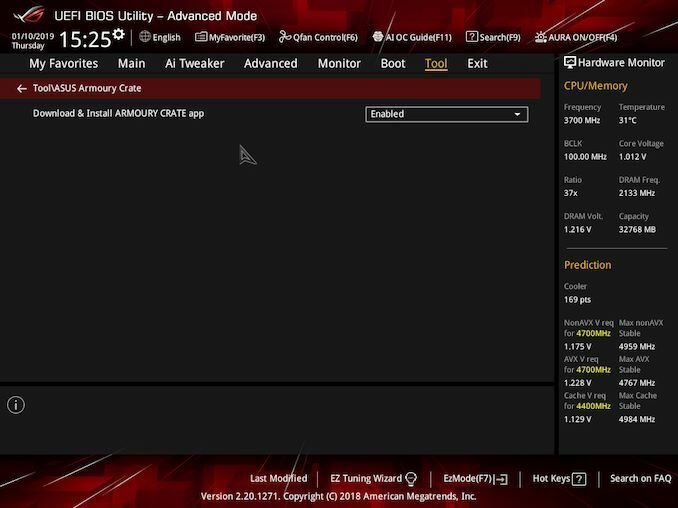 At first, this was done without asking users for permission, but after a firmware update the Armoury Crate app can be enabled or disabled within the Tool section of the BIOS. I personally find it handy to have access to software that installs the drivers to get a system going useful, but with magnifying glasses on companies now with GDPR regulations at present, installing software with no option to opt out did cause some initial commentary. The firmware on the ASUS ROG Strix Z390-I Gaming is well laid out, easy to use and is very responsive to mouse clicks and key presses. 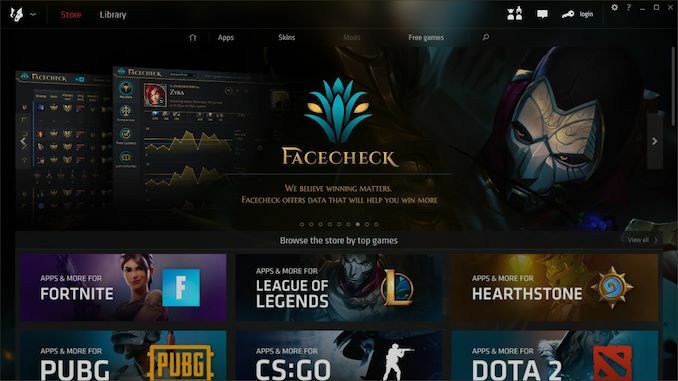 There are loads of overclocking settings that can be tweaked for the more ardent users and a colossal section of memory options for users to sink their teeth into. 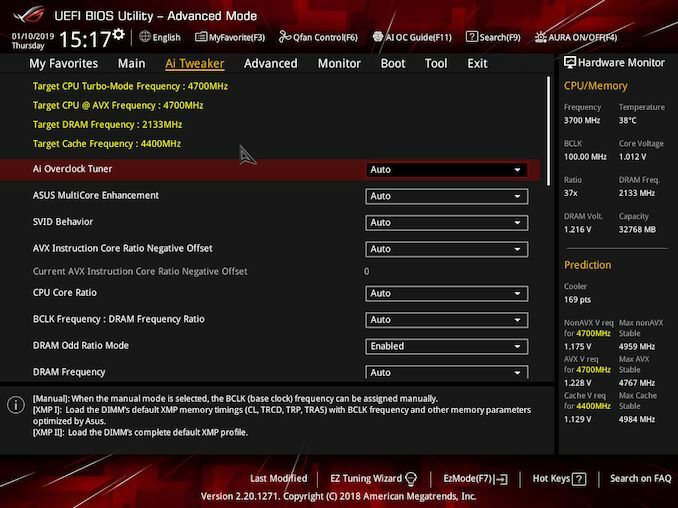 It should be noted that the majority of the settings on offer is something most users needn’t concern themselves with as they are for enthusiasts and overclockers looking to push their components to their limits. Unfortunately for users looking to customize RGB lighting within the BIOS, there are no options other than turning the LEDs on or off. 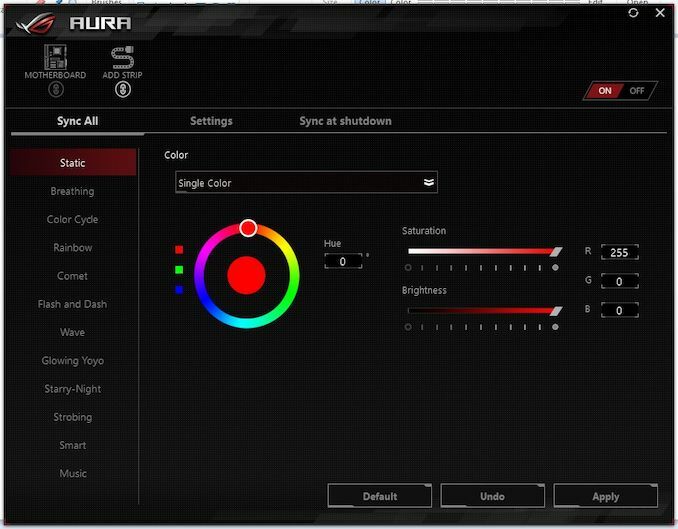 This seems to be a current trend on Z390 models and RGB customization needs to be done with the ASUS Aura Sync RGB software. The ASUS ROG Strix Z390-I Gaming comes supplied with strong software support with the useful and comprehensive ASUS AI Software which is an amalgamation of many different features. Also supplied are the ASUS Overwolf Software, the ASUS ROG Aura Sync RGB customization utility and a ROG skinned version of the CPU-Z monitoring utility. 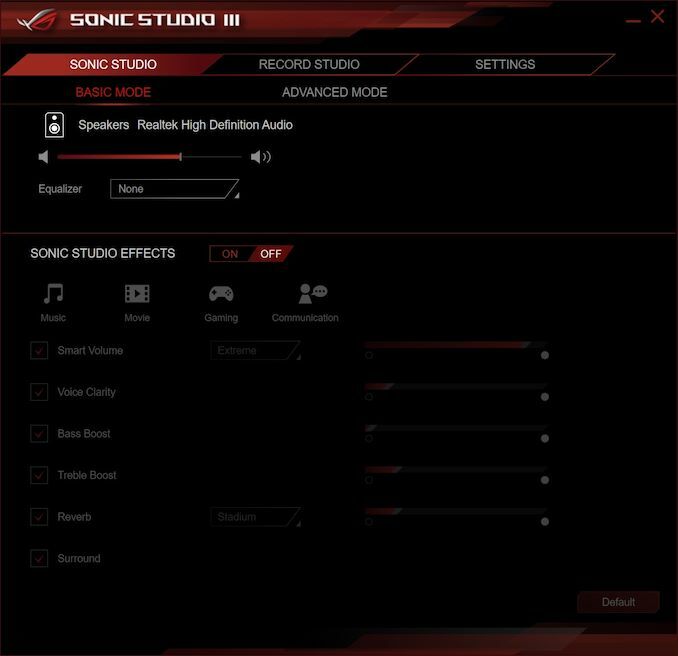 All of the software has the usual red and black ROG gaming theme and is what distinguishes the focus the Strix Z390-I Gaming has for, gaming. One of the most prominent features of the ASUS AI software is the sheer number of onboard features that can be accessed. ASUS specific features can be controlled within Windows including the Dual Intelligent Processors 5 technology which allows users to optimize the system using a set of criteria set by ASUS. Other features include TPU (Turbo Processing Unit) which boosts the processor's frequency and Fan Xpert 4 which offers fan profile customization. ASUS AI is a software hub for enthusiasts and users looking to keep a keen eye on system performance and attributes like temperature. 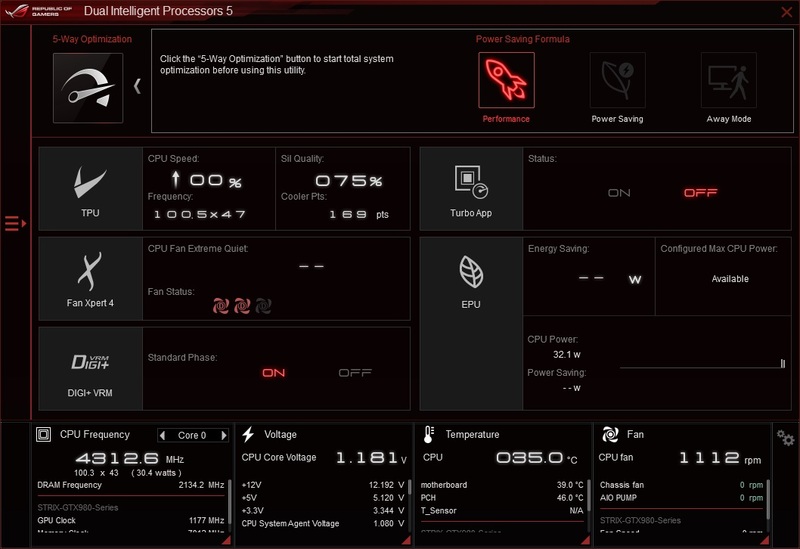 As with the other big motherboard vendors, ASUS rolls its software controlled overclocking feature into the main hub of the AI Suite much like MSI does with its Command Centre utility. Users can overclock the processor's core frequency and cache through both CPU ratio and the base clock frequency. When AVX workloads are present, systems can be put under intense load and ASUS does offer an AVX ratio offset within to protect overclocks from otherwise unstable and heavy work sets. Another big feature ASUS has rolled into its arsenal is the Cooler Optimism Scale. 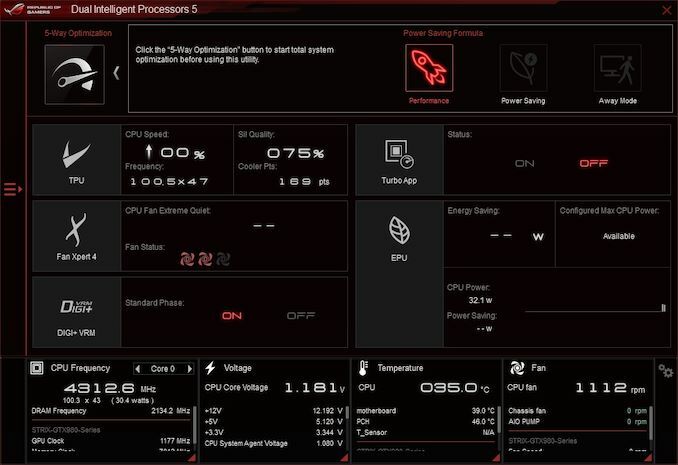 What this does is give users a score and overclock rating based on what it believes is an optimized overclock for the cooler that is installed. 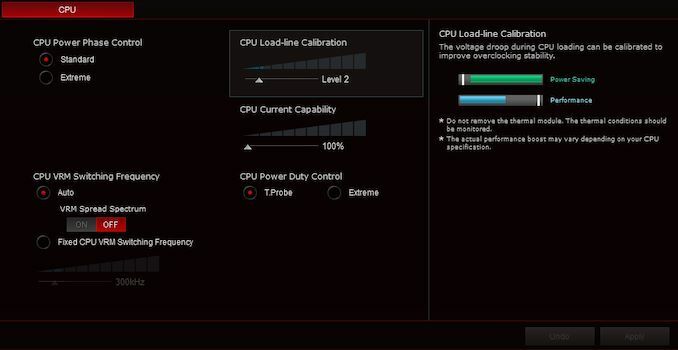 Not only does this feature present itself in the AI Software, but it also features within the BIOS which I will touch upon in the overclocking section where I test the settings it recommends against other profiles/custom overclocking settings. On top of an in-house fan utility representative of what’s available within the BIOS, ASUS also allows users to change its Digi+ VRM power phase control settings. A total of two profiles consisting of standard and extreme are available to select and CPU VRM switching frequency and VRM Spread Spectrum can be changed. 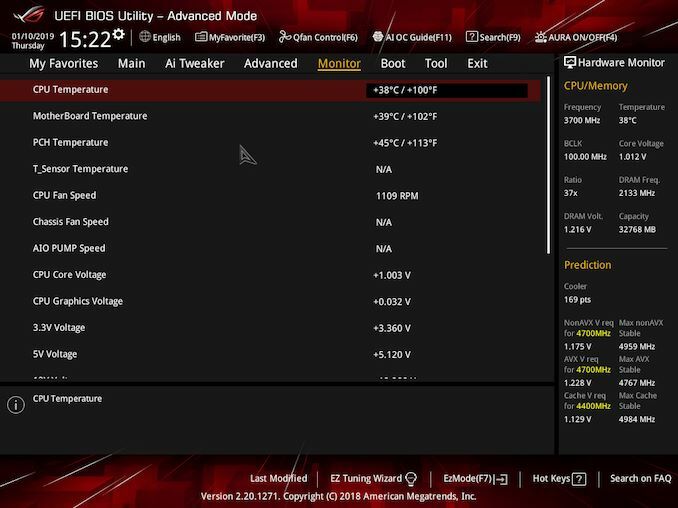 The CPU power duty settings can also be defined by temperature or set to extreme with little to no limits imposed on processors; more of a feature used by overclocks than gamers. ASUS Aura Sync is software comes designed to allow users to customize RGB and is supplied with its line-up of motherboards with built-in RGB LED lighting and with RGB strip headers. There are multiple lighting effects which can be selected including static, rainbow, comet and glowing yoyo. Selecting the desired color can be achieved by using the color wheel or the corresponding individual RGB color codes. 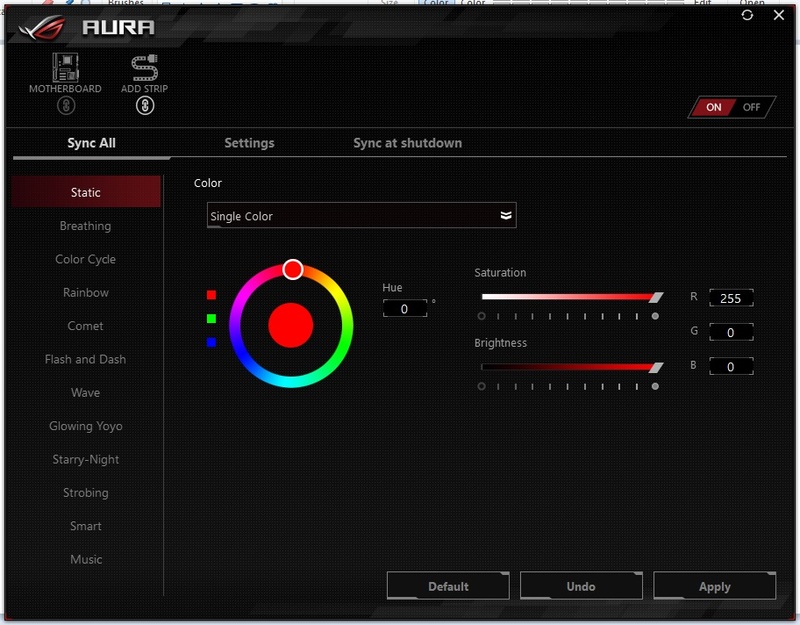 Users can also adjust the saturation and brightness of the RGB LEDs and sync or set each header individually, as well as having the option to switch them off altogether. The ROG SupremeFX S1220A audio codec which is based on Realtek’s ALC1200 codecs on the Strix Z390-I Gaming is compatible with the ASUS Sonic Studio III software. Downloadable from the Microsoft store, it offers the usual audio customization settings including equalizer presets, room correction options and speaker configuration setup. A customized equalizer can be used to fine tune audio and users can alter playback experience as well as use the software to create audio recordings.